Advanced Computing, Networking and Informatics are three distinct and mutually exclusive disciplines of knowledge with no apparent sharing/overlap among them. However, their convergence is observed in many real world applications, including cyber-security, internet banking, healthcare, sensor networks, cognitive radio, pervasive computing amidst many others. This two volume proceedings explore the combined use of Advanced Computing and Informatics in the next generation wireless networks and security, signal and image processing, ontology and human-computer interfaces (HCI). 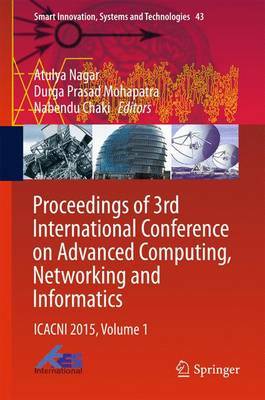 The two volumes together include 132 scholarly articles, which have been accepted for presentation from over 550 submissions in the Third International Conference on Advanced Computing, Networking and Informatics, 2015, held in Bhubaneswar, India during June 23-25, 2015.